Earn $3.82 in VIP credit (382 points)What's This? 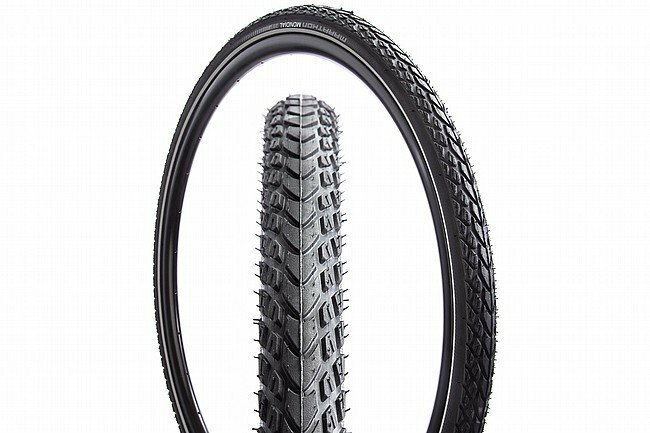 The Schwalbe Marathon Mondial DD 27.5" tire is designed to be the ultimate touring tire, regardless of the presence of asphalt. With a deep and aggressive tread pattern that pays homage to the Marathon XR, this tire is capable of conquering roads, tracks or trails on all continents. Featuring Schwalbe's most sophisticated TravelStar compound, the base, shoulder and center of the tire feature unique compounds for a smooth rolling and durable tire. To provide the kind of puncture protection needed when touring over hundreds of miles of chip seal, Schwalbe has included the Double Defense V-Guard technology throughout the sidewalls as well as under the tread.